i'm trying to create a wrapper C# file for modbusm.dll (win-tech.com/html/mbusocx.htm) ,i'm using dumpbin output for this. A call to PInvoke function 'TestApp!TestApp.MbMasterV7::ConnectModbusTCP' has unbalanced the stack. This is likely because the managed PInvoke signature does not match the unmanaged target signature. Check that the calling convention and parameters of the PInvoke signature match the target unmanaged signature. i have tried all calling conventions and getting same error. The .Net libraries are available for modbus protocol are not good enough for the new plc type i am working with. help needed ! First thing first, [email protected] means that 12 bytes are passed as parameters to the function, which means that short (which is 2 bytes long) is obviously incompatible. You need to pass 12 bytes as parameters, presumably as 3 DWORDs. Let us, for the sake of adventure, actually disassemble the binary to see what's going on there. 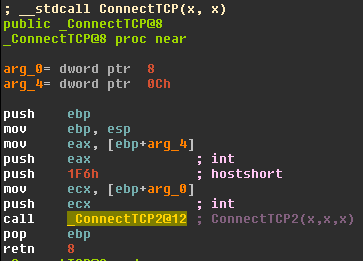 So: [email protected] is receiving 2 DWORDs as arguments and calling ConnectTCP2 with 0x1F6 as the second parameter (which is actually a short). Also, the calling convention is stdcall. This is often an indication that other memory is corrupt." It actually works, and it doesn't throw. On my computer, it returned 51 (when the structure and parameters were all zero). It is now up to you to understand each parameters and see how to properly call the function.